The Twentieth Annual UCI Undergraduate Research Symposium holds one process to be absolutely tried and true: academic research. Through this practice, human beings have deciphered various aspects of life that were once only myth and hearsay. The event also celebrates research culture as a whole, as there are many nuances associated with the field. But as the symposium identifies and appreciates these nuances with each passing year, the identity that makes up an academic researcher is reinforced stronger each time. This particular year, the symposium’s theme was “Passion and Values.” Exhibitioners both catered to and highlighted the driving force that pushes these undergraduate students to join the research ranks, as well as the personal qualities and values that are fostered and promoted by their mentors. Approximately 600 projects, 950 students, and 400 mentors were in attendance. Of this already impressive population, the Center for Unconventional Security Affairs would like to personally congratulate a select few. The first three include CUSA’s Transformational Media Lab researchers, Kehau Ahu, Brandon Duong, and Mariam Iskajyan. Ahu and Duong presented there research entitled, “The Art and Science of Film and Social Change: An Emerging Agenda,” which analyzes the overall landscape of issue-based film campaigns. Iskajyan presented her research, “Empowerment and Engagement Through Film-based Activism: A Survey of Invisible Children Participants and Impacts,” which examines the mental, emotional, and behavioral effects of Invisible Children screenings on participants. Although this was the first time presenting research for all three students, they expressed nothing but excitement and pride for their mounted presentations, standing in a forest of vastly varying research posters and topics. Ahu and Iskajyan will also be covering new stages of their respective research topics this summer at the Transformational Media Lab’s Summer Research Program. The symposium’s poster session was not the only demonstration of CUSA’s passion for research. In the morning, oral presentations were delivered by Dr. Richard Matthew mentees, Naomi Lichtner and Dahnish Shams. While Lichtner spoke about, “Peace Negotiations Via Environmental Cooperation in the Congo,” Shams talked about, “Boundary Organizations: A Redefined Tool for Environmental Communications.” Shams, another first time presenter, was honored to be associated with the event, describing it as one of the predominant highlights of his academic career at UC Irvine. Lastly, even a CUSA and UCI faculty member was awarded for his efforts in undergraduate research, but with good reason. Dr. Richard Matthew, director of CUSA and mentor to dozens of various students each quarter, was awarded with the symposium’s 2013 Chancellor’s Award for Excellence in Fostering Undergraduate Research within the School of Social Ecology, along with his student recipient, Benjamin Latham-Bryman. Most importantly, Matthew was also chosen by the UROP Faculty Advisory Board to receive the ceremony’s special recognition award, complete with a stipend to support the purchase of computer-related equipment. 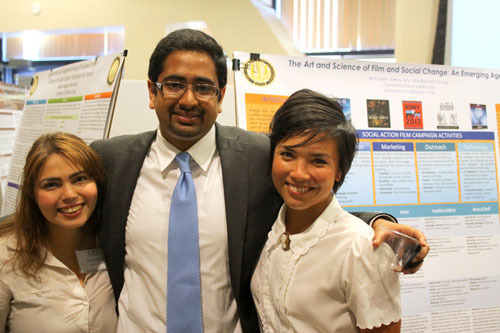 In summation, UROP’s 2013 UCI Undergraduate Research Symposium was a transformative experience for multiple CUSA undergraduates and their research. A consensus from the center’s participants is a of sense resilience with their work, given the many iterations and redirections that are commonplace. Through the culmination of this event, many are hopeful of the future impacts of their findings to the issues they target, like fish swimming upstream through a river of competition and crises.